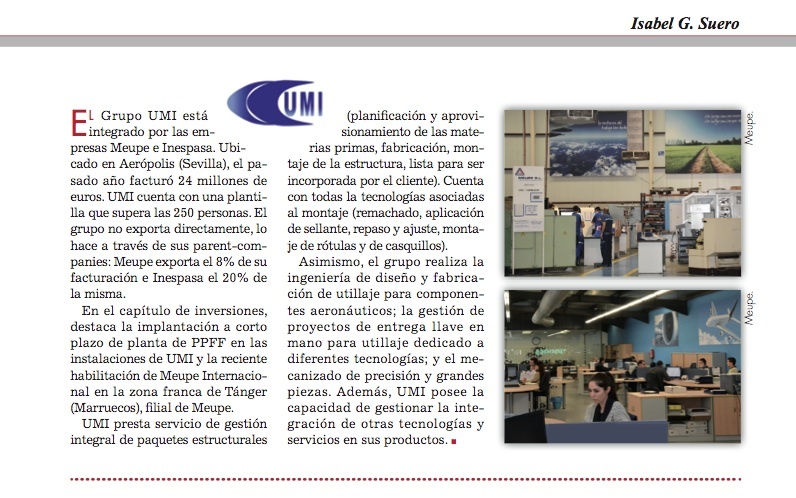 The Andalucía Económica magazine echoes the activities of the UMI Group in its edition of April 2014. The article, which appears in the section of companies representative of the aeronautical industry, includes a small report on the situation of the group formed by the Meupe and Inespasa companies. This specialised magazine briefly details the economic situation of UMI, its recent investments, the new projects, the territorial expansion, the engineering services and the packet of technologies employed in the execution of its work. A timely review that perfectly sums up the essence of this important group of reference in the aeronautical sector.